We've updated our review to reflect the latest safety data--the 2010 Soul is among a small set of vehicles to earn the IIHS' "Top Safety Pick" award. Fun, fun, fun: Kia tries a little Soul on for size, and it fits. TheCarConnection.com's car experts researched Web reviews for the 2010 Kia Soul to compile this full review. TheCarConnection.com's editors also drove the 2010 Kia Soul in order to sort through the opinions they found on the Web, to find a consensus among online car-review Web sites, and to get to the truth where reviewers had differing opinions. 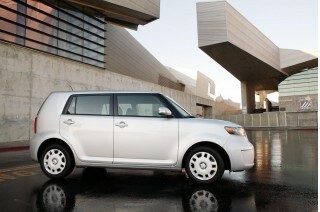 The 2010 Kia Soul brings a new attitude to the Korean automaker's lineup. 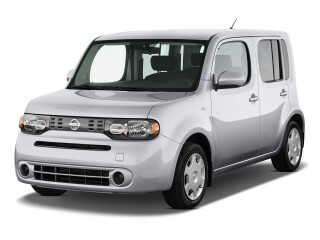 A far cry from the likes of the stuffy Amanti sedan, the Soul is a five-door urban wagon that neatly outsmarts the likes of the Scion xB and the Nissan Cube with a catchy style; a sharp, roomy, and well-fitted cabin; and a comprehensive list of safety and fun features. The 2010 Soul wins on styling, hands-down. The reverse boomerang of the rear end reminds some of the In-N-Out burger logo; to others, it's simply a crisp, rakish shape with a little bit of busy detailing up front. The front wears the new Kia corporate grille and friendly-feeling headlamps; the rear is less tidy, but the square, tall taillamps frame a light and lofty hatchback that's nearly vertical—a nice punctuation to the Soul's casual leaning stance. Inside, it's a refined blend of round shapes and embossed plastics—and a variety of colors and textures if you like, from red plastic covering the dash to houndstooth-check material swathing the seats. Two engines and two transmissions give Soulsters agreeable choices for city driving, if not much beyond that. The base Soul comes with a 1.6-liter four-cylinder making 122 horsepower and 115 pound-feet of torque. With the sole transmission, a five-speed manual, it's rated at 26/31 mpg. TheCarConnection.com did not have the opportunity to drive this model; Kia estimates only 5 percent of shoppers will order it, anyway. Most 2010 Soul wagons will sport a four-cylinder engine with 2.0 liters of displacement, 142 horsepower, and 137 pound-feet of torque. With either the light but long-throw manual shifter or the smooth-shifting four-speed automatic, this combination delivers 24/30 mpg. It's the standard powertrain on the three top Soul models: the typographically challenging Soul+, Soul!, and Soul Sport. Kia doesn't provide performance estimates, but at a few hundred pounds less than the similarly sized Scion xB, 0-60 mph times of less than 9 seconds seem possible. That moderate acceleration comes with an engine note that develops a bit of thrum at higher highway speeds. All Souls ride atop a conventional MacPherson strut front and torsion-beam rear suspension, and they have four-wheel disc brakes. Base and mid-line Souls wear 15- and 16-inch wheels. The Soul Sport leads the performance pack with 18-inch wheels and different suspension tuning. Across the board, handling is as tidy as any compact's, though most testers find that the 18-inch wheels on the Sport make the ride less comfortable on city streets. Ride quality and steering feel are otherwise the highlights of this conventional small-car package. The 2010 Soul interior has seats for five adults, Kia stresses. In front, the driver finds easy-to-use controls at hand and cheery gauges framed by the steering wheel—which is not the case with the Scion, for example. Knee and legroom are good, seat comfort is good, and headroom is great—even in the backseat, where the middle passenger may be compressed for shoulder room. The second-row seats fold forward to boost cargo area over 53 cubic feet, and the cargo floor lifts to expose more storage area; an optional compressed-foam cargo organizer also fits in there. The Soul also has a two-tier glove box capable of holding a 15-inch laptop, a center console, an iPod-sized bin atop its center stack, and lots of cup holders. Dimensionally it checks in at 161.6 inches overall, 70.3 inches wide, 63.4 inches high, and it has a 100.4-inch wheelbase. In terms of safety, the 2010 Kia Soul exceeds the class standard with six airbags, anti-lock brakes, traction and stability control, and tire pressure monitors. Both the National Highway Traffic Safety Administration (NHTSA) nor the Insurance Institute for Highway Safety (IIHS) give the Soul their top safety ratings. The 2010 Soul also handily beats its older competitors in standard and optional features, with only the Scion xB nearing its offerings. Standard features on the base $13,300 Soul include tilt steering, air conditioning, Sirius Satellite Radio (the first three months of service are free), USB and auxiliary inputs for music players, and power windows. Lacking on all models are auto-up power windows and telescoping steering. The $14,950 Soul+ adds cruise control, steering-wheel audio switches, Bluetooth connectivity, and dual 12V outlets. The $16,950 Soul! gets a leather-wrapped steering wheel, a tan-and-houndstooth interior trim package, and a 315-watt audio system with speaker lighting, which illuminates according to music beat or "mood." The $16,950 Soul Sport has the same features as the Soul! but adds 18-inch wheels, sport suspension, metal pedals, and a red-on-black interior scheme. Options on various Soul models include a sunroof, the 315-watt audio system, and more than 60 accessories, from styling add-ons to interior trim. A navigation system isn't offered, nor is a hard-drive-based audio system, a notable omission. Kia's 10-year/100,000-mile limited powertrain warranty extends to the Soul.The Bottom Line: The 2010 Kia Soul outsmarts fun urban wagons like the Scion xB and Nissan Cube with uniquely kicky styling, more room, and an easygoing attitude. Granted, the styling of the 2010 Kia Soul is not for everyone, but don't be surprised to see a lot of thumbs-ups flashed your way if you happen to be driving one. Just when you thought funky imports like the Scion lineup, the Nissan Versa, and the Honda Fit couldn't get any stranger, Kia comes along with the 2010 Kia Soul to renew your faith in the ability of the big Asian automakers to churn out an endless array of quirky vehicles. Unlike some of the aforementioned vehicles that received lukewarm receptions, the new Soul Kia seems to strike all the right chords in reviews read by TheCarConnection.com. The new Kia 2010 Soul is a fun take on the now-popular "urban wagon" theme. The Soul is available in four trim levels, according to Automobile Magazine, which lists the options as "a base edition, the punctuated Soul+ and Soul!, and the top-drawer Soul Sport." 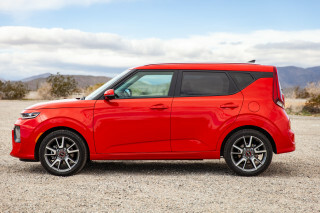 While unusual, those punctuated Soul suffixes are worth getting used to, as TheCarConnection.com's editors note that only 5 percent of 2010 Kia Soul models will be in the base trim. Reviewers simply love the new 2010 Kia Soul, which Automobile Magazine calls "a kimchi-flavored take on the xB and, without question, the wackiest thing to come out of Korea since M*A*S*H." Autoblog reports that, "for a small car, this thing has gobs of character," but they note "most people will probably find the [Kia 2010] Soul either irrepressibly cool or simply fail to 'get' its style altogether." Motor Trend adds that the Kia Soul "is cute and instantly likeable and comes in eleven colors (eight at launch) with names like Alien and Dune." In terms of specific styling elements, Cars.com says the Kia Soul sports "a rounded front end that's reminiscent of a Mini Cooper" and features "short front and rear overhangs and a fairly raked windshield." Despite the obvious attention that Kia paid to the exterior design of the 2010 Kia Soul, reviewers are pleased to note the interior isn't simply an afterthought. Autoblog highlights the plethora of "funky shapes, patterns, and retina-flambeeing colored plastics" inside, but they add, "like a skate punk that hides a straight-A report card from his mates, there's a practicality streak inside the Soul." Other automotive experts agree. Edmunds points out that the "ergonomic layout within the Soul's cabin is sensible, with all the major controls logically arranged and within easy reach of the driver." Motor Trend is impressed with the Soul Kia's interior as well, finding it "a lot more appealing than a traditional economy car's," and despite the various flamboyant elements, they feel it is "less out-there than the xB's." The 2010 Kia Soul's engine can provide a bit of fun, but the ride on Sport models is unduly harsh. The 2010 Kia Soul is, first and foremost, a practical and stylish economy car. As such, performance doesn't rank high up on the priority list, but reviews read by TheCarConnection.com still manage to uncover some redeeming performance qualities on this boxlike Kia 2010 model. According to reviewers at Automobile Magazine, the base Soul Kia "gets a 122-hp, 1.6-liter in-line four and a five-speed manual; the rest of the range gets a 142-hp, 2.0-liter four with the stick shift or a four-speed automatic." If you're dying to get your hands on the 1.6-liter version of the 2010 Kia Soul, prepare for a lengthy search, as Kia expects only 5 percent of Kia 2010 Soul models to be so equipped. Reviews of the 1.6-liter are unavailable, since Kia didn't make any accessible to the press, but the Soul Kia's 2.0-liter "provides plenty of power for a vehicle this size," according to Motor Trend. For those of you who want some acceleration numbers to put the power in perspective, Jalopnik says that, "with the five-speed, 2.0-liter fourbanger and a little luck or skill you can achieve a 0-to-60 mph time in the low eight-second range." While the Kia Soul's engine numbers are perfectly adequate for typical city driving, reviewers don't recommend you push the engine too hard, since Car and Driver warns you'll find significant "engine thrash," and Automobile Magazine reports that "all you really get is noise" if you try and "rev it to the moon." While reviewers were only available to test the larger engine on the 2010 Kia Soul, Kia did make both transmissions available for the press, though neither left a very positive impression. Automobile Magazine reports that "the five-speed manual gearbox has [a] vague feel," while Car and Driver laments the "recalcitrant shifter" available on the Soul Kia. Although Motor Trend reviewers "expect the automatic transmission to be perfectly acceptable," reviewers at Autoblog simply "can't recommend it, as its lack of a manumatic override and reluctance to let the engine rev puts the kibosh on fun." However, given the engine's poor high-rev performance, you might not be missing much. With its rather light curb weight and smallish engines, the 2010 Kia Soul is able to return class-competitive gas mileage. According to the official EPA estimates, Kia 2010 Soul drivers can expect to see 24 mpg in the city and 30 mpg on the highway—not world-class figures, but certainly not anything that would upset the Sierra Club. Professional reviews of the 2010 Kia Soul's road manners are quite mixed, with the exception of ride quality, which is universally panned. Motor Trend says that the firm suspension leads to better handling, but "some may not like the amount of bumps and road irregularities transmitted into the cabin." Automobile Magazine lodges similar comments, noting "the Soul's cost-saving conception inflicts it with road manners that aren't too far removed from those of the fairly uncouth Rio," which means that the Kia Soul's "ride can verge on cruel over imperfect pavement." When it comes to navigating city streets and mountain switchbacks, Jalopnik finds that the Kia Soul boasts "quicker-than-expected steering and less-than-expected lean." However, Edmunds points out that the Kia Soul suffers from a "darty freeway ride," while Motor Trend adds they "did notice that, in turns, the Soul exhibited a bit more body roll than expected." On the positive side, Edmunds praises the "solid braking numbers," observing that the 2010 Kia Soul stopped "from 60 mph in 128 feet." The 2010 Kia Soul is comfortable and attractive inside, but the intrusive road noise can wear on long drives. For a compact car, the 2010 Kia Soul offers a voluminous interior that affords both good passenger and cargo space. Road noise at highway speeds is the only consistent complaint from reviewers, who love the Soul’s interior space and apparent quality. Inside the Kia 2010 Soul, Cars.com says you'll find "seating for up to five with its front bucket seats and rear bench seat." Unlike with some compacts, which offer five seat belts but no realistic way of fitting five adults inside, reviews read by TheCarConnection.com show there is a very usable amount of passenger space within Kia's new econobox. Motor Trend says that the Soul Kia's "front and rear rows are surprisingly roomy, but long-legged passengers should try to get the front seat." Car and Driver, however, doesn't mind the rear seats on the 2010 Kia Soul, finding that they are "comfortably upright, with terrific legroom and headroom for two." Edmunds agrees, noting that "legroom is adequate even for rear-seat occupants, with much appreciated toe space under the front seats." Up front, Autoblog observes "good usable interior space, with spacious accommodations for two." Despite the wealth of passenger space, the 2010 Kia Soul still manages to devote an impressive amount of interior volume to storage, at least when the rear seats are in place. Car and Driver states that, "with the rear seats up and down, cargo volume is 19 and 53 cubic feet, respectively, versus the xB's cargo room of 22 and 70 cubic feet." Other reviewers point out that the xB offers significantly more space with the seats folded, but Autoblog says the Soul Kia still "offers a good amount of space for all your hipper-than-thou lifestyle accessories." Automobile Magazine also appreciates that "the folding rear seats create a flat load floor, and there's additional hidden storage in back as well," while Edmunds contends that the cabin offers "adequate" storage and the "split-level glovebox is surprisingly deep." Kia seems to win over the majority of reviewers with the materials and build quality on the 2010 Kia Soul, despite the fact that its list price is so low. Automobile Magazine is probably the harshest critic, and the extent of their criticism is that the interior is "glossy and hard but functional and inoffensive." Autoblog points out that, "while plastics are of the hard variety, they are all nicely grained and free of cheap-looking shine." Car and Driver loves the "expensive-looking instrument panel" on this Kia 2010 model, while Edmunds feels that "Kia has done a fine job of creating the impression of more expensive materials." In terms of build quality, Edmunds reports that "panel gaps on the Soul's dash are impressively tight," and Autoblog confirms that "the interior seems to be well constructed." One of the usual benefits of solid build quality is a quiet driving environment, but unfortunately the Soul Kia's above-average construction doesn't translate into a low-decibel cabin. Automobile Magazine warns that "engine and road noise [can] be intrusive" while driving the 2010 Kia Soul, and Edmunds agrees that the Kia Soul exhibits "intrusive road-surface noise." The 2010 Kia Soul has outstanding safety credentials. The National Highway Traffic Safety Administration (NHTSA) gives the 2010 Soul five stars for front and side impact protection; the Insurance Institute for Highway Safety awards it a "Top Safety Pick" designation, with "good" grades for front and side impact protection and standard stability control. The automotive experts surveyed by TheCarConnection.com are impressed by the level of standard safety equipment found on the 2010 Kia Soul, which far exceeds the typical fare on cars in this price range. Motor Trend states that the Kia 2010 Soul lineup "comes standard with dual front, front-seat-mounted, and full-length side-curtain airbags." Autoblog gives "major kudos" to Kia for "making every safety feature it offers on the Soul [Kia] standard across the range," as all 2010 Kia Souls "come with standard four-wheel disc brakes that include anti-lock- and electronic stability control." Cars.com reviewers round out the safety list by noting the inclusion of "active head restraints for the front seats" on the Kia 2010 Soul. One of the most important factors in preventing an accident on the road is driver visibility, and despite the unorthodox styling of the 2010 Kia Soul, reviewers find that visibility is pretty good. Edmunds goes so far as to say that, "thanks to the higher seating position and large greenhouse, overall visibility is excellent" from within the Soul Kia. Autoblog agrees, finding that "visibility is generally very good, though the D-pillar does leave a blind spot that warrants extra care." It's hard to believe what $20,000 will get you these days, but a fully loaded 2010 Kia Soul Sport stickers for less than that. With the 2010 Kia Soul, Kia is aiming to capture some of the Scion brand's customers by offering a similar range options that allow for total customization of the Soul. However, even if you forgo all of the available extras, reviews read by theCarConnection.com show that the base Soul Kia is no featureless economy vehicle. The 2010 Kia Soul is available with a range of standard features, which vary according to trim level, but Cars.com states that "standard features in the base Soul include air conditioning, a tilt steering wheel, a CD stereo with USB and auxiliary inputs, and cloth seats." Edmunds notes that the "2010 Kia Soul Sport features an upgraded audio package with more power and a dedicated subwoofer cleanly cached in the rear cargo area," while Cars.com says that Kia Soul+ models get "cruise control, keyless entry, Bluetooth cell-phone connectivity and a height-adjustable driver's seat." 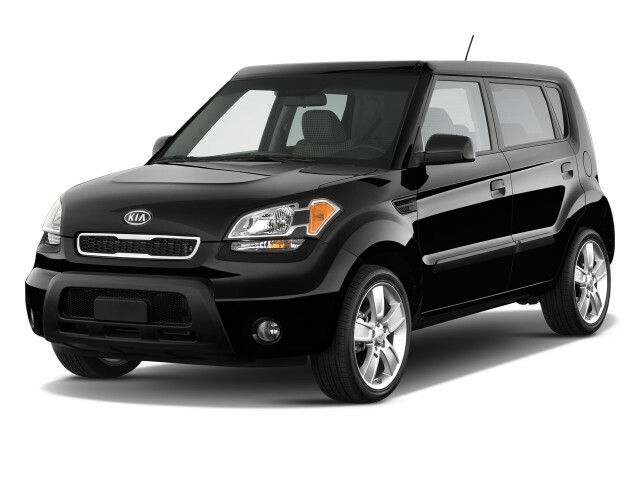 The remaining option, Kia's 2010 Soul!, adds a standard leather-wrapped steering wheel and an upgraded interior. The Soul Kia lineup is one of the more modifiable on the market, as Automobile Magazine attests: "what it lacks in autocross ability...the Soul makes up for in customizability." Motor Trend reports that "several options are offered [for the Kia Soul], including a red and black interior, beige and black hound's tooth seats and similar accents on the tailgate and hood," as well as several body kits. Autoblog points to the availability of "some 50+ dealer-installed accessories, including body kits, wheel choices, and so on." Among the non-styling elements available for purchase on the Kia 2010 Soul, "a power sunroof" can be added to the Soul Kia Sport, says Car and Driver. 2010 Kia Soul 5-Door Wagon Automatic ! 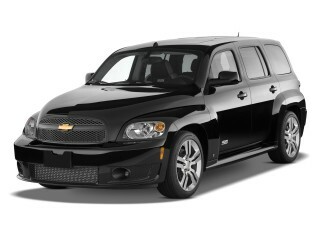 my daily driver and very pleased it's not my HEMI but the fuel economy is not a HEMI either ! she's a stiff ride but I'm ok with that very roomy for a small car . solid little car fun to drive . Looking for a different year of the Kia Soul?